Defender Pro Total and SpyHunter 4 are similar applications that provide protection against malware, including spyware, Trojans, viruses and other types of malicious software. To start with Defender Pro, the product was developed by the Epartners LLC Company. Epartners LLC is cybersecurity company which has operated in the industry for more than 10 years. 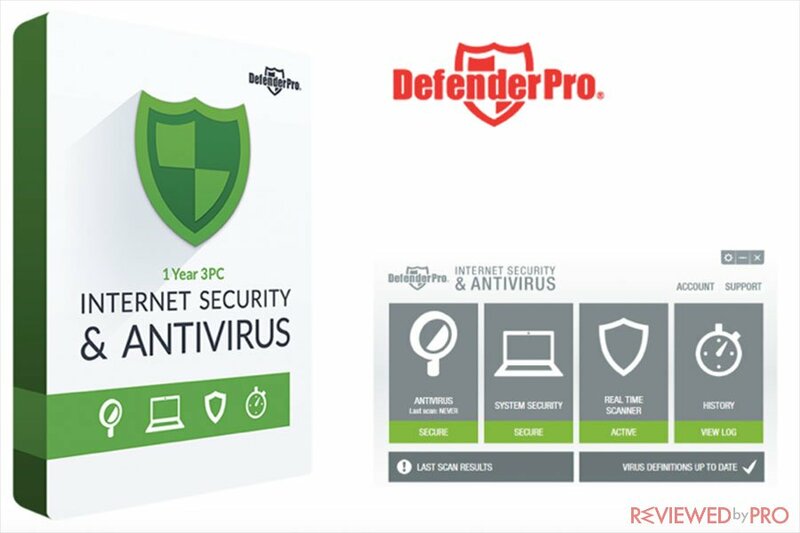 Defender Pro offers two versions of the software Defender Pro Internet Security and Antivirus and Defender Pro Lifetime. Defender Pro is an Internet security and antivirus software that provides users with protection against viruses, spyware, ransomware, and identity theft. In addition, it provides other useful security features including real-time protection, firewall, private and safe browsing features and also can be used for multiple PCs. What is even better, Defender Pro also includes free customer support from 9 am to 9 pm for seven days a week. As researchers at Reviewed by Pro noted, Defender Pro is pretty popular in North America and has over a million users. 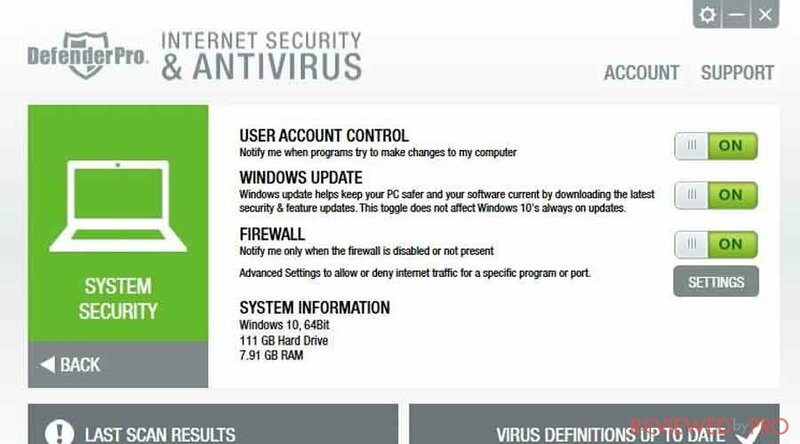 The Internet security and antivirus package is developed for a non-experienced home user who can face some security issues. The download and installation are easy and quick. The software is compatible with PCs that run Windows 7,8, 8.1, and 10. (32-bit or 64-bit) with minimum 1.5 GB RAM. Administrative rights, an Internet connection, and a web browser will be required during the installation. After the installation the system updates itself and it takes only two minutes to update the database of the application. Researchers at Reviewed by Pro decided to try Defender Pro and revealed its main features, pros, and cons. Defender Pro detected some threats other anti-malware applications did not find. Defender Pro offers many useful features mentioned before and even three types of scanning, including complete, quick and advanced scan, which is very convenient and allows users to check the most vulnerable, or every single file and program in the system. Defender Pro does not have any negative impact on system performance, it also does not slow down computer during the scan. Works completely fine with another antivirus software. The software has a good-looking and easy to operate user-interface. It is pretty annoying that while the security application was scanning the system, there is no chance to browse another system menu. The full scan is slow compared to similar antivirus software; it took 40 minutes. After the 30-day test, researchers came up with the final verdict. They noted that Defender Pro is reliable antivirus software for the reasonable price. Quality computer security and antivirus software for a reasonable price with a good-looking interface and intuitive management system. 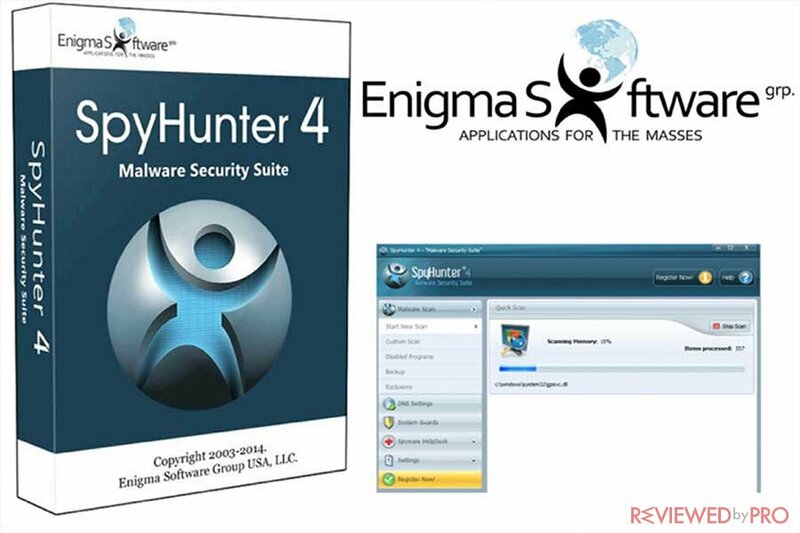 When it comes to SpyHunter 4, the malware security suite was developed by Enigma Software Group based in the USA. The company has been active in the cybersecurity market since 2013. Just like Defender Pro, SpyHunter 4 provides users with free and paid versions of the software. The free version includes two types of scan: a quick and a complete scan, in order to detect viruses, malicious programs or infected files. However, when it comes to malware removal, users have to purchase the paid version of the software. The malware security suite detects and removes the latest viruses and malware, including spyware, Trojans, rootkits, ransomware, keyloggers and other malicious applications. It is worth to mention that SpyHunter 4 is certified with TRUSTe Verified, AV-Test and the certifies partner. The installation is very easy and the program size is only 78.9 MB so the download will not take long. Researchers at Reviewed by Pro decided to test the SpyHunter 4 malware detection and removal tool. The test took approximately 30 days and revealed the effectiveness of the security package. Researchers indicated that SpyHunter 4 is a perfect solution for those who browse the Internet and download files from the web without analyzing them. Thus, SpyHunter 4 provides advanced protection against rootkits, ransomware, worms and other cyber threats, users can easily get on the Web. The quick scan is very fast and it is quite effective, it took only three to five minutes and detected most of the infected files. The full scan detected even the smallest threats other antiviruses did not reveal. If users face any issue, the customer support is very helpful. SpyHunter 4 does not have any negative impact on the system, even during the scan. Every time you start the computer, the automatic scan starts to perform and it is impossible to turn this feature off. It is worth to mention, that it guarantees an advanced protection, but sometimes can be quite annoying as well. In addition, after reinstalling or uninstalling an application on the system, there is no option to Restart the system later. This also can be quite annoying sometimes, especially if you are in the middle of some kind of important online or offline activity. Researchers at Reviewed by Pro after the 30-day test were pretty satisfied with the software performance and its results. SpyHunter 4 is a reputable malware removal tool with a high detection rate. It notices all the threats that are lurking on your system, even the ones unnoticed by other similar applications. It is extremely effective against spyware and can be a great choice for your home or office. SpyHunter 4 provides users with an advanced malware detection and removal feature and can uncover even the smallest infected files and programs on the system. Defender Pro Total and SpyHunter 4 offer similar high-quality protection against malware. Both of these security packages have good detection and removal rates. However, if you are looking for basic protection with more useful features, such as identity protection, private and safe browsing features, Defender Pro Total is just right for you. Meanwhile, SpyHunter 4 does not provide as many features but provides more advanced malware detection and removal features that can ensure complete security against any types of malware. ^ Defender Pro Total. Defender Pro. ^ Jake Doevan. Defender Pro Total Review. Reviewed by Pro . ^ Olivia Morelli. SpyHunter 4 Review. Reviewed by Pro. 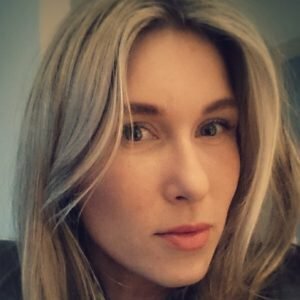 This entry was posted on 2018-02-15 at 07:42 and is filed under News.